Many on the Dissident Right have a thing for Tucker Carlson. Like Ann Coulter, Carlson is one of the few mainstream media personalities whose positions seem to conflict very little with our views. He’s actually an interesting phenomenon since he has a knack for identifying many of the Right’s enemies and asks them all the correct questions, and yet professes to hold middle-of-the-road (and typically American) values. He also almost never punches right. This has led many dissidents to wonder if he is /ourguy/ in disguise, a based shitlord undercover in the Overton window who, with a wink-wink, nudge-nudge, has got our backs in an extremely important theater of the broader culture wars. 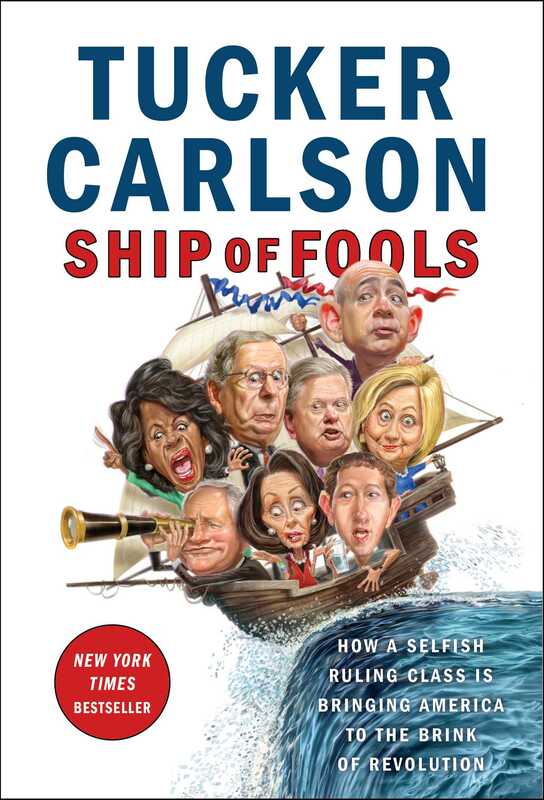 As with his gig on Fox News, Tucker Carlson’s new book, Ship of Fools: How a Selfish Ruling Class is Bringing America to the Brink of Revolution, keeps this question open-ended. Maybe he is just Opie from The Andy Griffith Show, all growed up and pining for the more idealistic and less fractious America of his youth? Maybe he would attack the Right if the Right simply had more power in today’s society? In either case, the central theme in Ship of Fools is a familiar one to people on the Right: that Democrats and Republicans have converged into a hostile elite that works counter to the interests of the majority of Americans. Predictably, not once does he insert the word “Jewish” before the word “elite”; nor does he insert the word “white” before “Americans.” As such, literate, red-pilled members of the Right won’t have terribly much use for Ship of Fools. It is a book primarily for normies and best for those who are still not sure whom they are going to vote for in the midterms. At first glance, there really isn’t too much that distinguishes it from anything written by Rush Limbaugh or Michelle Malkin. Yet, Ship of Fools does separate itself from the conservative pack for reasons extremely important and absolutely essential for the existence of the Right these days. It has a sense of urgency – one might even say fatalism – regarding our national character and future as a nation. Carlson sees a civil war on the horizon and argues that the Left and Left-leaning members of the Right are the ones who are primarily responsible. They are also the reason why we got Donald Trump in 2016. If the Left wishes to not have populist nationalists like Trump in the White House, then they’d better clean up their acts and start catering to the needs of the majority. Tucker most often uses the tack of calling for ideological consistency and then expressing rhetorical dismay when the subjects of his book do not seem to care about ideological consistency. For example, he bemoans how the Left used to act as a safeguard against corporatist abuses, but now, with Silicon Valley, billionaire CEOs like Jeff Bezos, and moguls like George Soros bankrolling much of the Democrat Party, the Left has seemingly abandoned this platform. Carlson points to how Paul Krugman once criticized Soros for his predatory capitalism, but has since cooled it on the goose laying the golden globalist eggs. Only Ralph Nader gets high marks for consistency, since Nader has stayed true to his liberal ideals, which he formed as far back as the 1960s. Sadly, according to Carlson, Nader no longer wields much influence on the Left, which is the price he has to pay for his consistency. In place of the classic liberal, pro-worker agenda of the Democrat Party, liberalism today centers around identity politics, thanks in large part to it having been bought out by billionaires. Carlson brings up how Uber exploits its employees and how Apple deals with factories in China that overwork employees to the point of suicide. Yet these two entities get a pass from the modern Left for being politically correct in all the right ways. Companies can openly mistreat their employees (or “contractors”), but for the price of installing transgender bathrooms they buy a pass. Shareholders win, workers lose. Bowing to the diversity agenda is a lot cheaper than raising wages. Carlson turns to immigration by pointing out what’s obvious on the Dissident Right: that identity politics on the Left and the desire for cheap labor on the Right have caused the current immigration crisis in America. While we know the Right hasn’t always been this way, Carlson points out that the Left hasn’t, either, and offers a brief history of the nativist attitudes of organized labor in America. Prominent in Ship of Fools is Cesar Chavez, who adamantly opposed illegal immigration and would often employ brutal methods to enforce this opposition, such as assaulting Mexican “wetbacks’ (Chavez’s term) as they crossed the border into America. In a single presidential cycle, everything changed. In 2004, gone were concerns about protecting U.S. workers, stemming a torrent of illegal border crossings, or punishing employers reliant on illegal workers. Instead, the 2004 Democratic platform called for an amnesty for illegal immigrants and a path to citizenship. Vows to protect the border focused only on keeping out terrorists, drugs, and weapons, not on illegal immigrants themselves. The 2008 platform went even further. Now, not only did the party demand an amnesty for current illegal immigrants, but it also called for an across-the-board hike in immigration visas for both family members and skilled workers. The Democratic Party now endorsed unrestrained mass immigration. Paul Ryan, of course, faces the pointy end of Carlson’s pen for going soft on immigration as well. Ryan’s March 2018 spending bill outlines the contempt with which the Republican elite views the immigration crisis. It limited the hiring of additional ICE agents, limited the number of illegal immigrants the agency could hold at any time, and while it allocated $1.6 billion for border security, not a dime of that money could be spent on a wall. Meanwhile, the bill paid for border security in various countries in the Muslim world. As with Nader, Carlson brings up another lost soul on the Left who was foolish enough to remain buoyed amid the inexorable wave of progress: John Tanton. Tanton, a co-founder of the Sierra Club and lifelong progressive, opposed increased immigration back in the 1970s because he feared the catastrophic environmental effects of the increasing human population. Tanton remained a liberal in good stead until the Southern Poverty Law Center (as is their wont) recently attempted to smear Tanton as a Nazi. After this, no environmentalist would support him, and thanks to a $200 million cash influx from a pro-immigration activist billionaire named David Gelbaum, even the Sierra Club has disavowed him. (It was either that or be lumped in with “racists and white nationalists,” according to Carlson.) Carlson reports that Tanton is currently living in a nursing home and suffering from Parkinson’s disease, and so can no longer defend himself from his enemies. Then, of course there’s the neocons. Any fan of Tucker Carlson Tonight on Fox News will know that Carlson really has it in for truculent “conservatives” who tirelessly beat the war drums during George W. Bush’s presidency but have now abandoned conservatism thanks to a Republican president who is less committed to war than his predecessors. Max Boot and Bill Kristol get justifiably shellacked in this chapter. For schadenfreude value alone, it’s probably the best bit in the book, and the one the Dissident Right would likely enjoy the most. Indeed, Carlson’s characterization of Boot as a neocon Yosemite Sam who hasn’t yet found an enemy of Israel he didn’t want to invade is downright hilarious. In retrospect, Boot’s words are painful to read, like love letters from a marriage that ended in divorce. Iraq remains a smoldering mess. The Afghan war is still in progress close to twenty years in. . . .
What’s remarkable is that despite all the failure and waste and deflated expectations, defeats that have stirred self-doubt in the heartiest of men, Boot has remained utterly convinced of the virtue of his original predictions. The animus wasn’t personal. Kristol got along with Buchanan when they saw each other. Kristol didn’t even disagree with most of Buchanan’s views on social questions. In private, Kristol was as witheringly antigay as Buchanan was in public. The disagreement was entirely over foreign policy. In keeping with the theme of the book, Carlson attempts to demonstrate how both Left and Right have converged to make these senseless twenty-first-century wars happen. He describes how the Left used to be anti-war (especially during the Vietnam War), and then chronicles the pro-war attitudes of both Bill Clinton and Barack Obama. He also reminds us of how a majority of Democrat senators voted in favor of the Iraq War in 2002. He doesn’t forget to include Secretary of State Hillary Clinton’s decision to take out Muammar Gaddafi in 2011. While interesting, painting Democrats as being as hawkish as neocons might be the biggest stretch in the book. One can argue that despite its occasional belligerent rhetoric, the Left is as anti-war as it has been since Vietnam. Yes, Bill Clinton waged wars, but after the debacle in Somalia he put few boots on the ground and preferred air strikes and missiles to get his way. He offered tepid responses to the first World Trade Center attack, as well as to the attack on the USS Cole. Most tellingly, he had his chance to take out Osama bin Laden and chickened out. Carlson mentions none of this. He also doesn’t mention that Barack Obama’s use of drone strikes follows the same pattern on the Left: don’t fight, bomb. George W. Bush and his neocon handlers, however, put boots on the ground that resulted in thousands of American servicemen dying, and thousands more enemy dead on the field. Yes, Carlson’s point about Left and Right converging on war is well taken, but one side really was more gung-ho about war than the other – that is, until Donald Trump came along. Carlson speculates that this might be one reason why increasingly-irrelevant hawks like Boot and Kristol hate him so. While Carlson’s chapter on speech suppression is useful for anyone tracking the decline of America, it would be an equally hard sell to lay such suppression at the feet of the Right. So he doesn’t do it. He simply excoriates the Leftist elites for turning their back on the First Amendment, something that most on the Left would never have done fifty years ago. He covers Milo Yiannopoulos’ and Ann Coulter’s aborted speeches at Berkeley, Charles Murray’s getting shouted down at Middlebury College, the ACLU’s refusal to protect the speech of the protestors at the first Unite the Right rally in Charlottesville, and similar bits of twenty-first-century political ephemera. Despite abandoning his central theme of convergence, this chapter winds up being a nice reminder of how anti-free speech the Left really is. It also provides names that folks on the Right should never forget, such as Wisconsin District Attorney John Chisholm and Prosecutor Francis Schmitz, who ordered illegal raids on the homes of conservative activists in 2015 following Governor Scott Walker’s reelection. I certainly would have forgotten that sordid episode if not for Carlson. 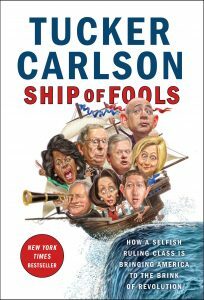 Carlson’s greatest accomplishment with Ship of Fools is to accurately describe the current and future troubles of the republic without taking sides on race. Many of the bugbears in the book are clearly Jews, and Carlson makes no mention of it. Neither does he mention race realism. And yet, his points ring true. America is slipping into tribalism and identity politics. America is headed for another civil war. Right now, the fault line is between whites and nonwhites. But as America grows more racially diverse, rifts will inevitably open between more groups. In a tribal system, every group finds itself at war with every other group. It’s the perfect perversion of the American ideal: “Out of many, one” becomes “Out of one, many.” This is the unhappy, blood-soaked story of countless civilizations around the world. It never ends well. But it does make for effective electoral politics, and that’s the point. There’s no faster way to mobilize voters than to stoke their racial fears, while promising to deliver for their particular tribe. It’s irresistible. At the moment, the coalition of identity groups has held together because it is united against white male power. But rapid demographic change makes this unsustainable. When the traditional scapegoat becomes insufficient, various factions will turn on one another. Chaos will ensue. So, does this mean that Carlson sees identity politics for white people as a bad thing? Bad, but necessary, perhaps. To his credit, he doesn’t explicitly blame white people for engaging in it. Perhaps he secretly supports white advocacy? Perhaps he’s just being a good journalist by keeping his opinions to himself? In either case, he predicts that America will be “over” the moment whites become like any other interest group, squabbling over public funds. He’s right about that. He also does not want that to happen. While most on the Dissident Right predict that it will happen—and, not only that, must happen, given what we know about human nature—Tucker Carlson holds out hope that it won’t, that the America he grew up in will be restored, and that the descent into identity politics can somehow be reversed. Ship of Fools is an eloquent testament to that hope. Ironically, however, it is Carlson’s own arguments of convergence and Leftist oppression that threaten this hope. If our elites are as bad as Carlson says, then, really, what hope is there? People on the Dissident Right have prepared themselves for the day when that hope will be dashed forever. I just hope that when that day comes, we’ll make room for righteous whites like Tucker Carlson, who will finally want to come in from the cold.